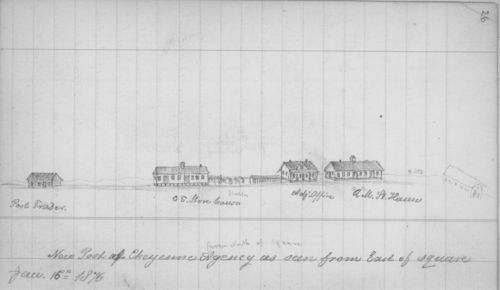 This pencil sketch of the New Post of Cheyenne Agency, Indian Territory, is taken from the Ado Hunnius diary and depicts the post from "east of square." The drawing shows the post trader, C. S. store house, Adj. office, Q.M.[x]. House, and stables.